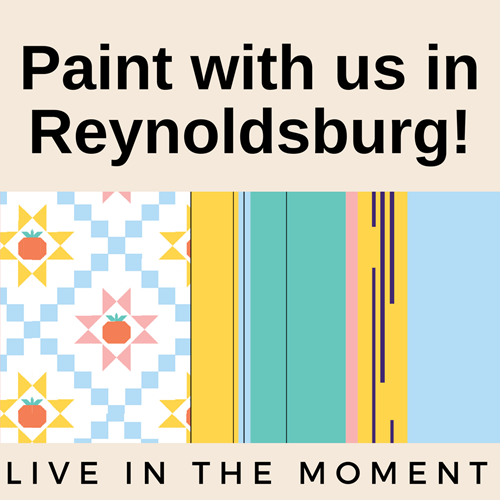 Take time to “Live in the Moment” by joining with your friends and neighbors to paint a mural symbolizing the Reynoldsburg community’s vitality, openness and optimism. The mural will be located on the side of the Performing Arts Center at the Reynoldsburg High School Livingston Campus. You don’t have to be an artist to help! We will have opportunities to help with priming or painting using a paint-by-number system that makes it fun and easy for anyone to participate. This project is in collaboration with the Reynoldsburg City Schools, the City of Reynoldsburg Parks and Recreation Department, the Alcohol, Drug, and Mental Health Board of Franklin County (ADAMH) and ALTernative. Where: Performing Arts Center at the Reynoldsburg High School Livingston Campus, 6699 Livingston Ave.
We will announce the date to celebrate the reveal of the mural soon!